I posted this photo on Flickr a few days ago; it shows my dad, who, as an actor and broadcaster, would frequently perform as Santa for charity events. There's a Mac angle to this, too: I've used Bias Inc.'s SoundSoap software to restore some old Christmas recordings he made. 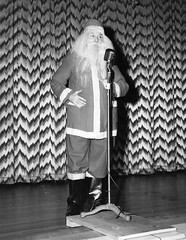 You can read more about my dad Santa�and download an MP3 of one of the restored recordings�by going to the photo's page on Flickr. Apple has just released an update to its Aperture digital photography application, which I wrote about last week in a Macworld "First Look." The updater weighs in at 11.9MB. It's supposedly available for downloading, though at this writing, the link isn't working. I'm grabbing it through Tiger's Software Update utility. I've written a "first look" at Apple's Aperture program; it's available for your reading pleasure at Macworld's Web site. Last month, I wrote that I'm having the "audio echo" problem with my new 15-inch PowerBook. It's a nasty problem that makes Apple's newest 15-inch PowerBook all but unusable for audio applications. Preferences and reboot. I used the terminal app to delete it, but it should work from [the] Finder as well." Veddy interesting. I'm attending a conference and haven't had time to test this (I hope to get to it tonight). But I thought I'd pass it along in the meantime. Here's a little more detail from Elgato Systems' press release: "Elgato Systems today released EyeTV software 1.8.4. This free update offers a convenient, one-step export of recordings to formats that are optimized for viewing on both video-capable iPods and on televisions connected to iPods." "With EyeTV 1.8.4, EyeTV users can now export their EyeTV recordings to a video-capable iPod using two new preset formats. One preset uses QuickTime H.264 compression, Apple's preferred format. The second preset uses MPEG-4 compression, which encodes up to five times faster than H.264 and has higher resolution output. The MPEG-4 preset is recommended as it provides the best quality for viewing either on an iPod screen or on a TV screen. Neither preset requires QuickTime Pro."